Investigators found that six of 17 deans at UCLA have routinely submitted doctors’ notes stating that they need to fly in a class other than economy due to “medical reasons,” including one dean who regularly participates in endurance athletic events. Other excesses abound, including taking flights costing more than $10,000, taking chauffeured town cars to the airport and dropping off their pets at kennels on the way, and spending nights at expensive hotels – all at public expense. The costs to UCLA over four years amounted to $2 million, as illustrated in this graphic by CIR’s Lauren Rabaino. Meanwhile, newly released figures show UC payroll grew 6 percent in 2012, reported the Sacramento Bee. Payroll at the teaching hospitals jumped almost 10 percent over last year. Federal funding for UC’s 191,000 employees in 2012 dropped by $28 million over 2011, and from educational fees by $40 million, according to the Daily Californian. 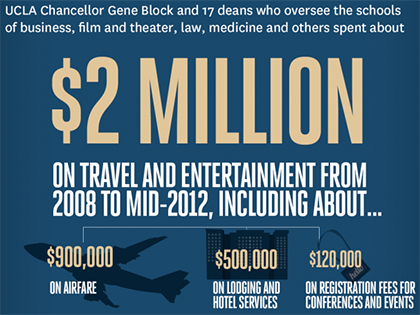 At the same time, UC’s funding from gifts, grants and contracts increased by $24 million. UC officials said pay increases were not responsible for the rise and attributed it instead to growth in staffing, enrollment and research activity. “UC salaries are below market. That does make it hard to attract top talent,” a UC spokesperson admitted. Unintentionally evoking the struggle of Harvard workers to win union representation in the 1980s with their slogan, “We can’t eat prestige,” the spokesperson cited alternatives to compensation as incentives, such as UC’s public service mission. UC Davis has hired an associate chancellor for strategic communications to help the campus’s image at a cost of $260,000 in salary plus other perks, writes the Sacramento Bee. Everyone should be able to retire with dignity with a pension after a lifetime of work," according to an op-ed in today's Daily Californian written by UPTE's Berkeley president Tanya Smith and UPTE member Paul Brooks, an elected staff representative on UC Retirement Advisory Board. They point out that executives will come out "unscathed" from UC's pension changes, while ordinary employees will suffer. Low-wage workers at UC Berkeley represented by AFSCME Local 3299 took their contract fight to the doorstep of Berkeley’s new chancellor after UC broke off negotiations and imposed its last offer on the bargaining unit. CSU, last week urged President Obama and Congress to close "an innovation deficit – the widening gap between needed and actual investments" in research and higher education — that is jeopardizing our role as an innovation leader and threatening the country's economic health. The state's Public Employment Relations Board (PERB) meets this week to decide whether three groups of first-year resident physicians at UC Irvine’s medical center should have collective bargaining rights as part of a physician resident union, according to the Orange County Register. PERB is expected to decide in fall which groups should be included in the union, which was formed in 2011. A big victory in national labor politics: after thousands of activists mobilized to pressure their senators, the National Labor Relations Board (NRLB), the federal body that governs labor law in the private sector, has five confirmed members. Senate Republicans had been refusing to confirm the Obama administration’s board appointees, crippling its ability to enforce bargaining rights or protect 80 million private-sector workers from employers’ illegal actions. The fight was led by the Democracy Initiative, founded by UPTE’s national union, CWA, in coalition with the Sierra Club, Greenpeace, the NAACP, and others. It doesn’t take a rocket scientist to come up with a formula to strengthen Social Security, says rocket scientist Rush Holt, who is also a US House member from New Jersey and a candidate for the Senate there. In this video, he says we don’t need to raise the retirement age or cut benefits, just lift the cap on the Social Security tax so millionaires pay the same rates as ordinary workers.